In a trap, the combination of a support or bed having a clear opening in the center thereof, spring actuated jaws mounted on said support or bed, and an independent pan and trigger adapted to be applied to either side of said trap. 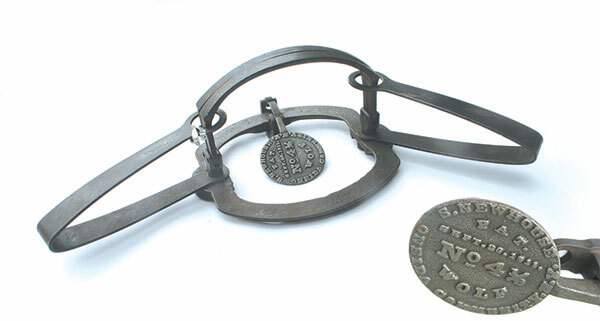 For a short time in the early 1900s, Oneida Community made the open-bottom traps with Newhouse springs, jaws and pans, in sizes No. 4, 14, 4-1/2, 5, and 15. There were three base assemblies: No. 4 and No. 14 with offset-jaws; No. 4-1/2; No. 5 and No. 15 offset-jaw version. Most open-bottom traps are stamped Abbey & McLeod/Pat. on the flat upper surface of the round base while others only carry the size number on the undersurface of the base, near one of the jaw posts. Abbey & McLeod traps with the detachable pan assemblies are a rare find, indeed, with no examples of the No. 6 known to exist. The No. 4 is most often found in antique trap collections. Reproductions of the trap are being made in No. 4-1/2, 5, 15, and 6. The maker of this current-production trap does not offer it as an original, but beware. One might be sold as such by a dishonest or perhaps simply misinformed seller. An original Abbey & McLeod may fetch $4,000 or more in complete condition ,with the detachable pan assembly.